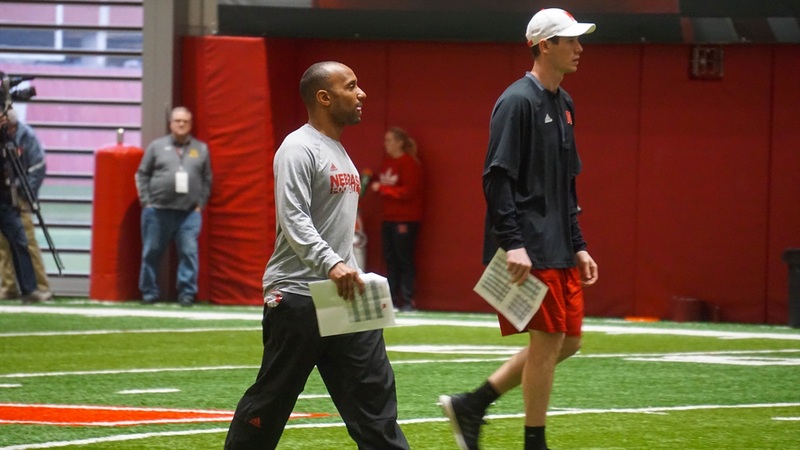 The install of Nebraska’s new offense is nearing completion with exactly two weeks left before the April 21 dress rehearsal. On Saturday, offensive coordinator Troy Walters told gathered media that the “majority of our playbook” has been put in and the guys are starting to grasp what’s being asked of them. “They’re doing a good job of picking it all up, understanding what we’re asking of them and we’ll just continue to go from there,” Walters said. “It’s all about reps and that’s why we practice fast, why we a lot of times split up into two groups so everyone’s getting reps. We think you learn better by playing and by getting the extra reps so a lot of the details, a lot of those little things are going to come from just getting extra reps and watching film and making sure that we’re champions in the film room and making sure that we’re learning from our mistakes. Saturday, the Huskers scrimmaged, and offensive assistants weren’t shy about saying the defense (again) won the day. “Today was not a good day, I can just be honest with you,” offensive line coach Greg Austin said. Running backs coach Ryan Held said there were issues with pre-snap penalties and some of the finer details of running the offense. But all Spring long, the coaching staff has maintained that this will be a process. There’s the old saying that Rome wasn’t built in a day; well, neither was 2017's sort-of-national-champion Central Florida team. During this staff’s first year in Orlando, improvement offensively wasn’t immediately felt. The scoring improved from just a shade under 14 points a game in 2015 (126th nationally) to 28.8 (66th) in 2016 but the yardage per play only bumped up from 4.12 (127th nationally) to 4.68 (123rd). Year Two is when things took off and the top-flight offense this staff has become known for arrived. “It’s going to take some time, I’m not going to put a timeframe on how long it’s going to take,” Walters said. “We’ve got some great student-athletes, they want to learn, they do everything they can to learn what we’re throwing at them but it’s going to take some time. At UCF it took us until Year Two before the guys really understood what we wanted, how we wanted it done. This summer will be just as important as the spring; if guys go out and continue to try and learn the playbook and grow, they’ll be in good shape once the fall rolls around, Walters said. Walters not being shy about saying things could move faster at Nebraska is interesting, though, on a number of levels. Faster than a two-year turnaround in Orlando? That would be impressive given the Huskers’ daunting 2018 schedule, but Walters didn’t shy away from expectations either. “This is not a 4-8 team, we’ve got enough to compete and be successful,” he said. “The standards are high at Nebraska, we didn’t come here to be 6-6, we didn’t come here to be average. We’re trying to win championships. That’s the mindset the guys have. >> The fullbacks on Nebraska’s roster are in a tough spot. Asked about their role in the offense, Walters started to laugh for a moment, then said “that’s tough because we really don’t use a fullback.” Most are working on special teams units. Held said the same. Held also said junior college transfer Greg Bell is looking impressive in the backfield. Bell was the first name Held mentioned when asked about his backs. >> Sophomore defensive lineman Deontre Thomas said he's working at defensive end in practice (on both sides). Ben Stille, another end, said he's up to about 280 pounds which should signal the end of his back-and-forth between outside linebacker and end. >> The Hunter Miller hype is legit. Austin said the redshirt freshman "is pushing for time right now.” In the absence of Cole Conrad and Michael Decker, Miller absorbed a good deal of the center snaps when spring ball began, and as the days have gone by he’s starting to look better and better. Conrad is back practicing. He was made available to the media for the first time Saturday. He said he’s working only at center. >> Wide receiver Tyjon Lindsey said things were “all said and done” for him to go to Oregon before Scott Frost left to take the open head coaching position at Central Florida three years ago. “When I was a sophomore I was being recruited by Scott Frost to go to Oregon, I was really close to one of his former players — De’Anthony Thomas — and I talked to him on my visits and he was like a mentor, a brother figure to me in my recruiting process,” Lindsey said. “He offered me my sophomore year to Oregon and that was my dream school. Walters said the sky is the limit for the sophomore. >> Quarterbacks coach Mario Verduzco says the competition at quarterback is still very much open. Even if it isn’t, he’s keeping his cards very close to the chest. >> Running back Jaylin Bradley is working in the return game as well as the backfield, Walters said Saturday. The sophomore back has heard love from his position coach, Held, as well as Frost and Walters before, but Walters gave him some love again Saturday. “We know when he gets the ball in his hands he can make guys miss. He has the size and the strength to run guys over as well.